If you walk into the HUB at the Language and Learning Resource Center located in Swan Hall room 301 this year and see a fresh new face, you can bet its Tony Balko. Balko, a whimsical, self-described media and technology junkie is the first ever director of the HUB, a part of the Harrington School of Communication. For those at the University of Rhode Island unfamiliar with the HUB, it is a center where all students and faculty alike can check out video cameras, laptops, audio equipment and other technology for use in their classes. Students can also work on a variety of projects and receive help from a team of student workers, and now of course, a new director. Although the HUB has been on campus for a few years, it has never had a head figure in charge. For a small space packed with so much fragile and expensive equipment, it has often surprised people as to why. Originally from small-town Smithton, Pennsylvania, Balko attended the University of Pittsburgh for his undergraduate career where he majored in Film Studies and minored in Studio Art. Â Upon receiving his degree, Balko taught English to teenagers in Lampang, Thailand. Once back in the states Balko attended graduate school until 2012 at the University of Wisconsin-Milwaukee, where he received a MFA in Film, Video, Animation and New Genres—or as Balko describes, “moving image.” Balko has had exhibitions in galleries at the Museum of Modern Art in New York City, The Institute of Contemporary Art in Boston, and the Museum of Contemporary Art in Chicago, to name a few on his impressive list. Balko moved to Chicago, where he felt right at home with the vibrant and explosive art scene, and accepted a teaching position at the University of St. Francis, teaching 2-D design and contemporary art practice. Balko “works primarily in the moving image, he elicits ecstatic vibes via flickering color fields, dork fetishism aesthetics, and classic rock anthems,” as described on his website tonybalko.com. 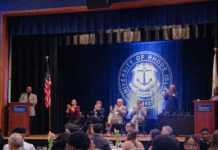 Hearing of the available position as director for the HUB through a friend involved at URI, Balko applied for the position and once he was accepted, quickly made the decision to move from Chicago to North Kingstown. Some of the changes that Balko is planning to implement at the HUB this year, although mainly administrative, are exciting. “We are trying to put things in place to make equipment easier to use and more transparent, so for people asking questions as to how to access the space, it will be much clearer for them,” Balko said. Balko and his staff also want to implement workshops for students in classes that are looking to use the equipment, are interested in graphic design or just want to expand their knowledge on media altogether. Balko enjoys coming into his new office each day and helping young and hungry students make art. “I love to facilitate people making art and moving image, and I like to help people be creative which is what has always attracted me to teaching, and why this job appealed to me in the first place,” Balko said. “I love meeting the students that are jazzed about making all sorts of media.